As the spring season comes, and the economy does not getting any better,many couples are facing to plan their own backyard weddings. Most people do not have a clue where to start when the subject of a event tents comes up. What size do you need? Think of height. You cannot put a 3 tall stage near the perimeter of most of the tents because of the lack of headroom. Think of power. The placement of your tent may limit what kind of electrical options you may have. Although the middle of a field allows for a lot of space,you will probably need to look into getting a generator to provide electricity for lighting and music. Think of layout. A lot of wedding tents companies will be able to suggest a wedding tent size for you or provide you with a CAD drawing of our wedding. Even if they charge for the service,it is worth it to actually see the layout of everything for the peace of mind. 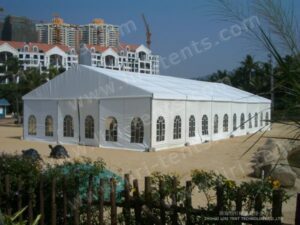 Many wedding tents rental companies provide tents to festivals and fairs. Make sure that you ask for a “wedding quality” tent,or you may end up with a striped circus-style tent!